Stormwater Management Limited are specialists in the supply and installation of surface water management & sustainable drainage systems. Stormwater provide a wide range of drainage solutions for source control, volume control and stormwater treatment. 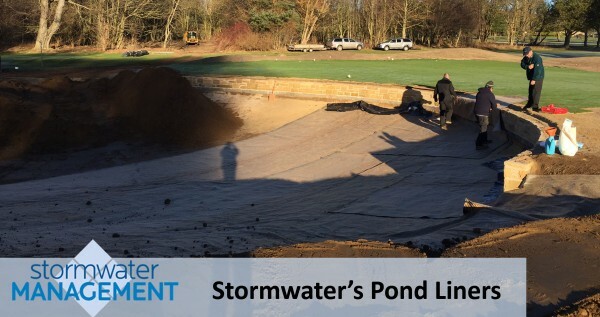 Pond lining is one of the most common applications Stormwater deals with. What is a pond liner? A liner is the layer between your pond and the ground, some people are under the impression that a pond doesn’t need a liner, or they can get away with an inadequate liner. Think of a pond liner as you would think of the foundation of your house: a good liner, as a good foundation, is essential for the pond to last and stay intact. A good liner does more than hold water in your pond, it helps keep your pond functioning as it should, and also helps protect your aquatic life. A good pond liner can; prevent pond breakdown from soil erosion, which can cause loss of pond depth and shape, eliminate leaks that cause water loss and protect against environmental dangers such as potentially toxic soil chemicals, which can harm your pond and aquatic life. One of the options Stormwater offers are GCL Pond Liners. GCL Pond liners have a range of properties which make them ideal for your pond lining application, these properties include; high chemical & climate resistance, self-sealing, slope stability, cost effective and no specialist welding is required.